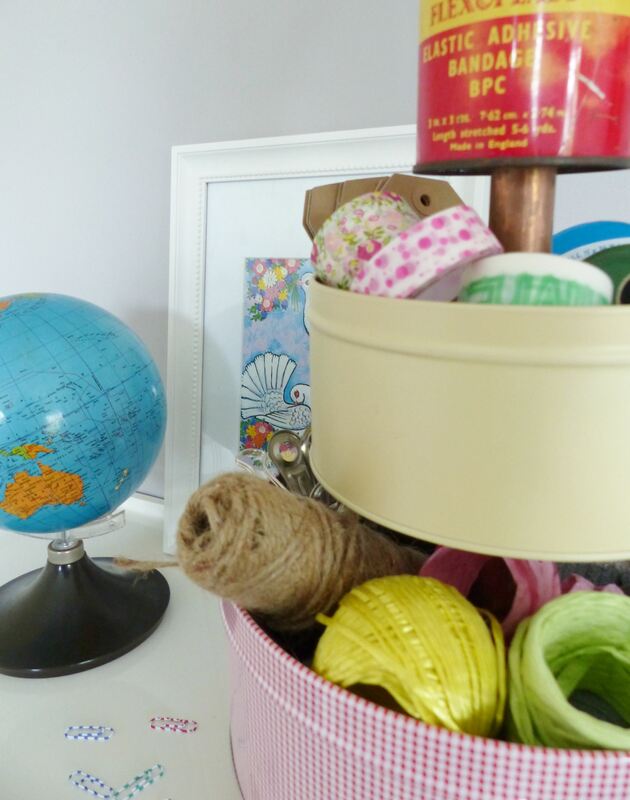 If you are anything like me, your desk is covered in lots of pretty stationery and craft materials. I know they should be organised into drawers but I use them all the time so want them close at hand. 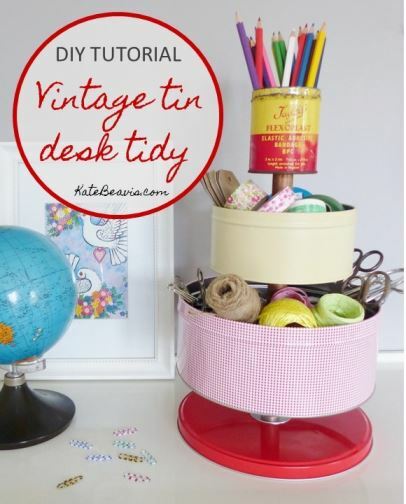 To solve this problem, I have created a desk tidy from tins – some vintage and some new – which looks great and is practical too. 3 tins of varying sizes to create a 3 tiered effect. I have used tins that are 9”, 6” and 3” in diameter. A threaded rod which can be bought from any hardware shop. I have used 500mm x 10mm. A 500mm length of copper piping which is wide enough to cover the rod. I asked a local plumber for am offcut. Source three tins of varying sizes that aren’t too deep. 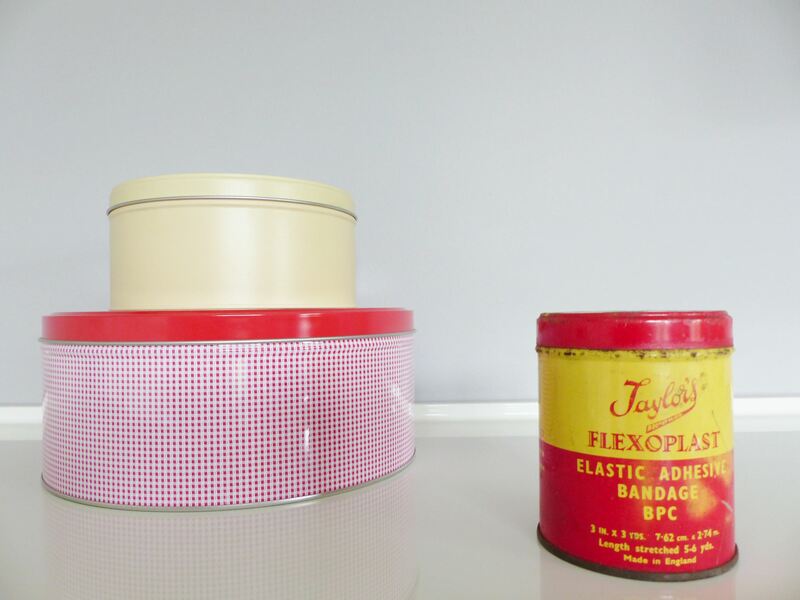 I used two second hand ones and one vintage one as I didn’t want to damage any of my favourite old cake tins! Make sure you have the lid for the larger ones as this will act as a base. Carefully mark the centre of each tin on the base using the ruler and the pen. It is a good idea to place a white sticker in the centre to help you see the pen mark. Repeat this on each tin and the largest lid. Place a centre punch onto the central point of the tin base, and hit with a hammer to create a small hole into each tin. This will help you when you come to drill ensuring that you create the hole as central as possible. 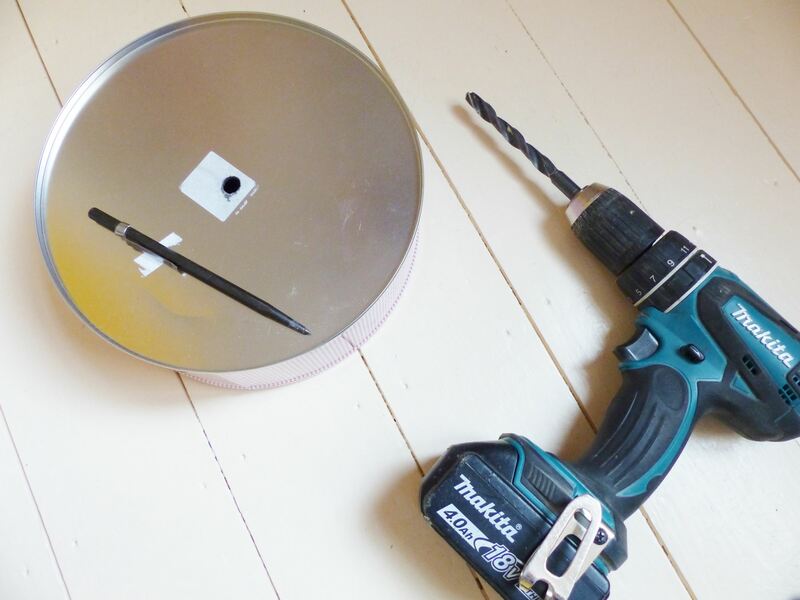 Next use the drill with a 10mm drill bit, to make the hole the correct size. Remember to do this outside or on a surface that you don’t mind if it gets damaged! 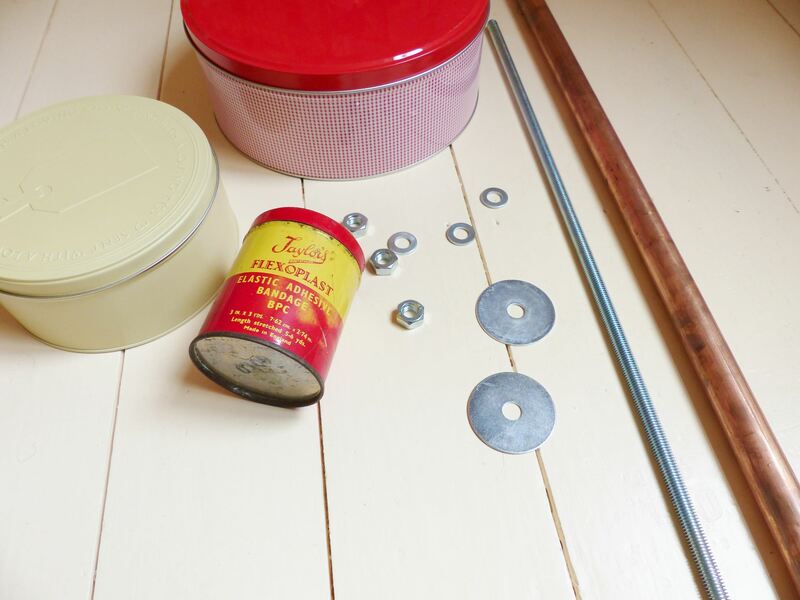 Thread the lid and three tins onto the rod to work out the exact positioning that you want. 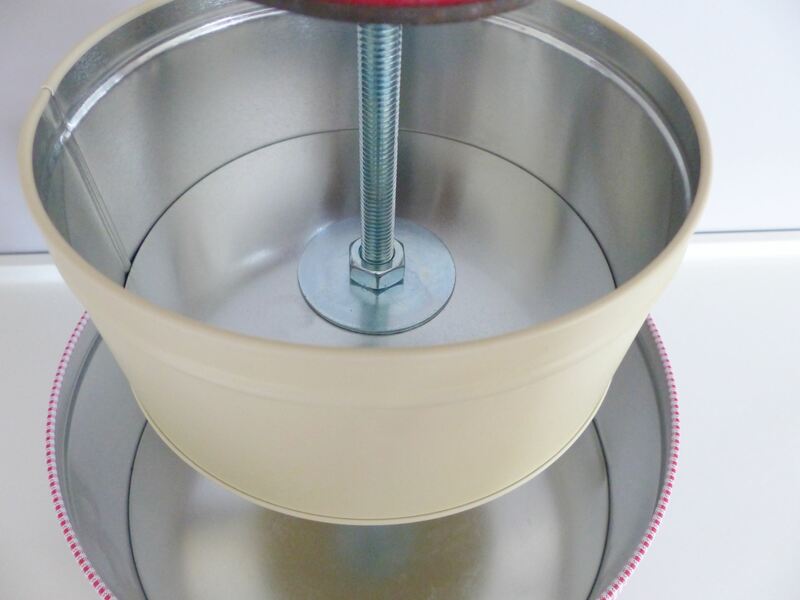 On the bottom and top of every tin including the lid, you will need a nut and large washer. Gently tighten them so you can see if the position of each tin is right for you. I used smaller washers for my top tin as it had quite a small base. Use the largest washer you can find as this will act as a support for each tin, otherwise it will be unstable. Now that you are happy with the positioning, you need to measure the lengths of each piece of visible rod. Using the hacksaw cut the copper piping into these lengths. I also needed to cut a piece of the rod off too as I wanted my desk tidy slightly shorter. Take the whole thing apart, then put back together with the piping covering all the rod. You will need a spanner to tighten each nut so that the desk tidy is stable. I have then filled it with all my pencils, tapes, string, cottons and scissors. It can also be used for sweets or cakes at a party! This first appeared in my monthly feature for Reloved Magazine. Read some of my other articles for them here, here and here.